Brent oil prices rose by 0.81% (US$0.45), as prices declined this week. Oil traded on October 12, 2017 at a price of 56.25 (US$/ barrel) and began the year at US$56.90 per barrel. 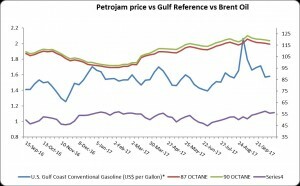 87 Octane prices declined week over week, by 0.67% (US$0.78 ). Additionally 90 Octane declined by 0.65% or $0.78 week over week. 87 Octane and 90 Octane opened the year at J$97.32 and J$98.98 respectively and now trades at J$116.03 and J$118.87 per litre. In its Short-Term Energy Outlook (STEO) update released this week, EIA forecasts that U.S crude oil production will average 9.4 million barrels per day (b/d) in the second half of 2017, 340,000 b/d more than in the first half of 2017. EIA’s close monitoring of current rig activity in several producing regions shows continued production growth from tight-oil formations, such as shale in the Permian region, driving overall production increases (Figure1). The STEO projects that the most significant production growth in the second half of 2017 will be in the Permian region. Permian production is forecast to grow to 2.6 million b/d in the second half of 2017, a 260,000 b/d increase from the first half of 2017. Production in the Permian continues to increase, in part as a result of West Texas Intermediate (WTI) crude oil average monthly prices that have remained higher than $45 per barrel (b) since the second half of 2016. Extending across western Texas and southeastern New Mexico, the Permian region has developed into one of the more active drilling regions in the United States because its large geographic size and favorable geology contain many prolific tight formations such as the Wolfcamp, Spraberry, and Bonespring. Increases in proppant intensity, lateral lengths, and changes to slick-water completions are also among the factors that have allowed the Permian to remain one of the most economic regions for oil production despite the low-oil-price environment. WTI spot prices averaged $50/b in the first half of 2017, spurring deployment of more rigs to the Permian, which rose steadily from 276 rigs in January to 380 rigs in September. The STEO projects that the Permian region rig count will continue to grow from an average of 341 rigs in 2017 to 371 rigs in 2018, and the WTI price is forecast to average $49/b for the second half of 2017 and $51/b in 2018.